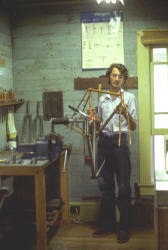 Maker of Silk Hope & McLean Bicycles. Grave marker uses Mclean's granite table. at the New York International Bicycle Show. Bob became the exclusive USA distributor for McLean. Originally from Wilmington, N.C., McLean Fonvielle went to the School of the Arts in Winston Salem to study visual arts, then he traveled to England to learn bike frame building. He became an apprentice at Holdsworthy Ltd. in London, under the direction of Roy Thame. 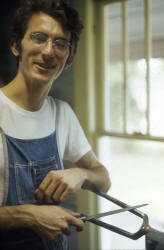 In 1972, McLean returned to the States and started his business near Chapel Hill, NC. His home and workshop were situated in an alternative lifestyle farm house 4 miles out in rural Saxahawpaw, NC. McLean named his bikes Silk Hope, after a little sleepy mill town near his workshop. He also designed the logo himself using the griffin as the centerpiece. 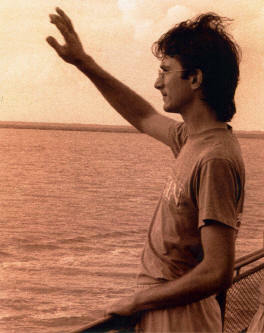 After receiving requests from customers for a less expensive model, around 1978 he offered the McLean brand at a lower cost. The model Silk Hope would remain full custom, the model McLean more standardized. The workmanship was the same however. He soon realized that he was spending virtually the same time and effort on both Silk Hope and McLean frames (he couldn't bear to short change the McLean frames) and so he combined his models and all his frames became branded McLean thereafter. The McLean frames are differentiated from Silk Hopes by having serial numbers that start with an "M". McLean Fonvielle's aesthetic aim was a nearly Shaker like simplicity; he foreswore razzle dazzle cutouts and multi color paint jobs. He was VERY conservative in his design approach and scrupulous in his integrity for build quality. 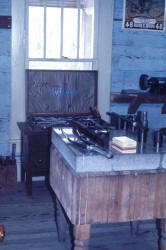 He would study and sweat the relative matching of pre-curved Reynolds fork blades, for instance. In the beginning he had only gold or black (choice) head badge decals, no down tube decals at all. Sounds like he was a retro-grouch, but actually he was a really great guy, very happy and generous. I took the B&W photos for his first brochure and he & I argued because he didn't want any superlatives in the text......He said people could just look & see his workmanship, so he didn't want to brag about it.....and if they didn't see the quality of the work, he thought they should wait till they were more knowledgeable before getting one of his bikes! He died of an unforeseen heart failure in his basement while riding an exercise bike. McLean was a non smoker, a vegetarian,& a fit person who only a year or so before his death had married Lanier. He was finally becoming well known after an 11 year career run at making frames. 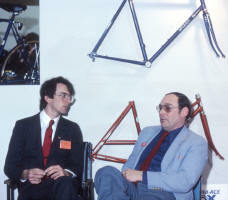 Toward the end, Cycle Imports in Cornish, Maine, had become an effective national sales outlet for the frames. 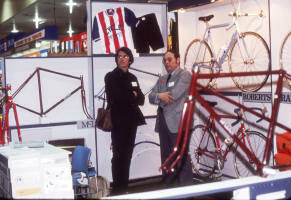 McLean frames were displayed in the Cycle Imports booth at a few New York International Bike Shows and sold around the country in small numbers. There were a surprisingly large number of orders going to Texas. During the peak years, my shop (Toga at first, then changed to cycles de ORO) sold an average of two frames a month. Over the years, McLean built 4 frames for me personally; I have three now, including the first one he made for me in 1975. I sold it and it changed hands many times when, through sheer luck, I was able to rescue it from ignominy... It was offered for sale to the shop as an unidentified "junker" ltossed in the back of the seller's pickup! Whew! I am the "official" source for what remains of the Silk Hope and McLean decals, which are available free to owners doing restoration; however I will only send them to bonafide professional bicycle-painting businesses, to ensure that there will be no sub-standard paint or not-really McLean's work out there with new McLean decals. Note: as per McLean's preferences, Silk Hope frames may also have McLean down tube decals, but McLean frames may not have Silk Hope decals.